A few years ago, Vitamin D deficiencies were known to be common only in populations that possessed dark skin, and those who were minimally exposed to sunlight. However, in the past few years, Vitamin D deficiency has become a concern in pregnant women, and a whole lot of research in this area is underway. A recent article in The Times of India, highlighted the importance of treating vitamin D deficiencies in pregnant women. An infant of three months who was initially diagnosed with a viral infection, and later on, septic inflammation of the heart actually died due to a deficiency of vitamin D that progressed the disease to death. 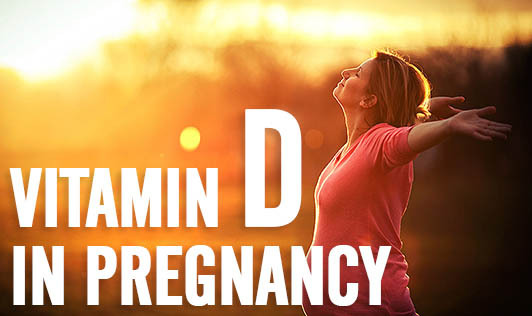 This has thrown some light on the importance of vitamin D during pregnancy. An adequate amount of Vitamin D is necessary for foetal growth, bone development, and weight gain associated with pregnancy. By the third trimester of pregnancy, almost 20-30g of calcium gets deposited in the foetal skeleton. For the developing foetus, transplacental passage of vitamin D is the only source of the vitamin. Hence, the infant solely depends on the mother to meet it's requirements. If the mother is deficient in this vitamin, it could affect both the mother and the developing foetus. In infants, viral pneumonia, lower respiratory tract infections, an increased incidence of seizures due to low calcium levels, development of weak bones, and an increased susceptibility to chronic diseases at a later stage in life, are a few of the outcomes of a deficiency of this vitamin. The effects are nothing less in pregnant women too! Women who possess low levels of Vitamin D during pregnancy, have an increased chance of a C-section delivery. They may also have an increased susceptibility to develop pre-eclampsia (high blood pressure) that could have several complications. Some studies also show that pregnant women with low levels of vitamin D have a three-fold increase to develop Gestational diabetes and are twice as likely to develop a bacterial vaginal infection compared to a pregnant woman with no deficiency of the vitamin. Many of us may think that this deficiency in pregnant women could be corrected with supplements in the future, but the fact is that, a Vitamin D deficiency can start affecting your baby right from the start of development in your womb! Some rich sources of Vitamin D are eggs, liver, fortified milk, oily fish like sardine, mackerel, salmon and tuna, and fortified cereals. So, all you pregnant women out there, please do check your vitamin D status and talk to your doctor/dietitian about how to meet the requirement.